It took me 10 years and 3 attempts to actually write this book, though I've had it in mind for over 15 years. 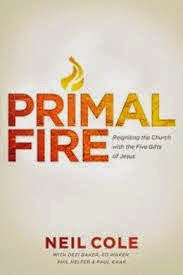 Primal Fire is a book that any Christian can read and find helpful in their calling to serve Jesus. It is not about a model of church or a style of leadership, it is about being "in Christ" and letting Christ within you be evident to all. Primal Fire is a paradigm shifting work that will affect the way we understand ourselves and how we relate to one another in Christ's body. Primal Fire looks at the Magna Carta of ecclesia: Ephesians 4:1-16 and provides clarity and vision. As I wrote the book I had two goals in mind for the reader: 1. that the reader would find Jesus evident on every page, and 2. That the reader would also discover themselves on the page. I think the book succeeds in those goals but I've also found that we learn more about our family and friends by reading this book. There are few people who have actually functioned fruitfully in an APEST team for a long period of time, but my coauthors and I have. Books written by committee are not easy to read. For that reason I wrote every page of Primal Fire, but I didn't write it alone. Most books on this subject are from an author who has one of the gifts. The result is a book that leans heavy toward that gift. I wrote this book along with the influence and help of the other four gifted team members who are mentioned on the cover: Neil Cole (apostolic), with Dezi Baker (prophetic), Ed Waken (Evangelistic), Phil Helfer (Shepherding) and Paul Kaak (Teaching). This team has served alongside one another for almost 20 years and helped ignite the organic church movement. Each is a mature leader in their giftedness and that experience is found on every page. This makes the book helpful because it is balanced and based upon real experience. We draw out the strengths of each gift as well as the shadows that each one casts (the dark side of each gift that reveals why we need each other to shed light on our blind spots). We also explain how these gifts work best together for a variety of tasks. Much of the learning of this book you cannot discover without years of working together through a variety of challenges. All that learning is now available to you minus the heartache of the hard lessons learned though mistakes. "This is by far Neil's best work. In fact, it's probably the best book I've read in the last 10 years." "Many in mission circles are talking about the need for an APEST community of leaders, but hardly anyone really has that kind of community. What Cole and friends express in Primal Fire is the real deal. It is not merely theory, but theology, theory, principles, practice, victories and pains through real life and ministry. It is a treasure to have this snapshot as captured in Primal Fire." "In the final section of the book, [Cole] gives a fresh look at reimagining the gifts in practice. And I found this a good way of combining all of the teachings into a coherent synopsis with vivid illustrations, that allow the reader a different perspective on how these gifts can (and sometimes do) function today." "I can say, without qualification, that this is by far the best book on this subject that I have ever read in my life. I consider it to be one of the best books that Neil has ever written – at least so far – and that is saying a whole lot considering the quality of his previous work." "A different Neil Cole [book] than I’ve read before." "Right now! Don't even bother reading my review. Just go get the book." "Primal Fire is one of the clearest, most encouraging, and most biblical and theologically based APEST books out there right now. Not to mention, it will also ignite a fire under you."